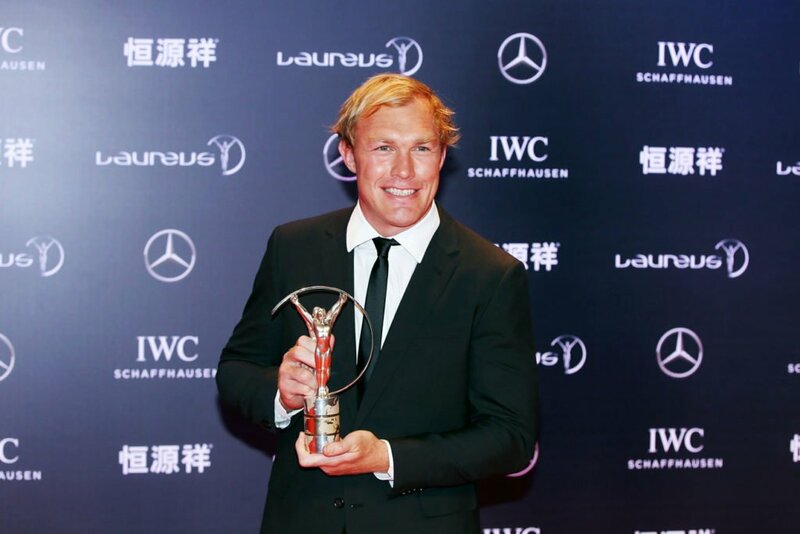 There was an emotional welcome from the guests at the Awards Ceremony at the Shanghai Grand Theatre for South Africa’s Schalk Burger, who won the Laureus World Comeback of the Year Award after recovering from life-threatening meningitis to win his place back in the Springboks rugby team. The world’s top tennis player Novak Djokovic, the Germany World Cup football team and brilliant young athlete Genzebe Dibaba were the big winners as the 2015 Laureus World Sports Awards were unveiled in Shanghai. Oliver Bierhoff, manager of the Germany team, was at the Awards Ceremony to receive the Laureus World Team of the Year Award following the historic victory last year when Germany became the first European team to win the FIFA World Cup in South America. It was Germany’s fourth World Cup triumph. Ethiopia’s Genzebe Dibaba was named Laureus World Sportswoman of the Year after breaking three world records in different events in two weeks. She is only the third person in history to achieve this feat, along with athletic giants Jesse Owens and Usain Bolt. There was a double success for the United States with wheelchair racer Tatyana McFadden winning the Laureus Disability Award and Alan Eustace receiving the Laureus Action Sports Award after his record-breaking freefall from the edge of space. Host nation China was celebrating after the Laureus World Sports Academy gave two special Awards. Retired tennis star Li Na, who has fostered a dramatic growth of the sport in China after winning two Grand Slam championships, was given the Laureus Academy Exceptional Achievement Award, while basketball legend Yao Ming, who had a stunning career with Houston Rockets until he retired in 2011, was honoured with the Laureus Spirit of Sport Award. During the event, it was also announced that Yao Ming and Indian cricket legend Sachin Tendulkar had been elected the newest members of the Laureus World Sports Academy. The Laureus Sport for Good Award was presented to the worldwide skateboard programme Skateistan, which uses skateboarding as the means to change young people’s lives in countries such as Afghanistan, Cambodia and South Africa. The globally televised Laureus World Sports Awards was hosted by British film and TV actor Benedict Cumberbatch. Among the presenters were Hollywood legend Bill Murray, star of iconic films such as Groundhog Day, Ghostbusters and Hyde Park on Hudson, Henry Cavill, who played Superman in the film Man of Steel, multi award-winning Korean actress Ha Ji-won, and actress and model Karolína Kurková. The Awards Ceremony is attended by legends of sport past and present and celebrates the achievements of the greatest sportsmen and sportswomen of the year. The Host Partner of the 2015 Laureus World Sports Awards is Chinese textile and wool company HengYuanXiang Group (HYX), and the event has received the strong support of the Shanghai Municipal Government. There are three additional Awards: the Laureus Spirit of Sport Award was presented to Chinese basketball legend Yao Ming, the Laureus Academy Exceptional Achievement Award was given to retired tennis star Li Na and the Laureus Sport for Good Award was presented to the worldwide skateboard programme Skateistan. Shanghai Municipal Committee Secretary, Han Zheng, and the Mayor of Shanghai, Yang Xiong, both attended the Laureus World Sports Awards Ceremony. Shanghai is a city enthusiastic about sport and promoting sports. Here you can find many international competitions held in this city, and there are many sports facilities around. This is the very first time Laureus World Sports Awards came to Shanghai, which is a big event in the sports history of Shanghai.I believe tonight’s ceremony will inspire more young athletes in Shanghai to fight for their dreams. The ‘Eternal Love’ programme, co-founded by HYX and the China Children and Teenagers’ Foundation, has won the China Charity Award twice, being honoured as the No.1 activity for caring for orphaned and disabled children in China. Also, the ‘HYX Literature Star High School Students’ Writing Contest’ has become the most influential event of its kind, attracting the largest number of contestants. In 1997 and 2007 HYX supported the ‘10,000 Teenagers’ Recreational and Sports Activities’ event in Tiananmen Square, in Beijing, China, to promote the health of teenagers.